Private Tour Guide for Medieval Chester and Port Sunlight on the Wirral. We will tailor your itinerary and if required we can also discuss suitable transport for your visit. 2-hour, half day and full day options available. 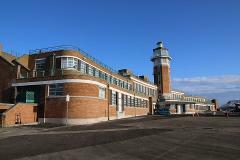 The "Liverpool After Brexit” walk looks at how a city which has changed from an industrial port into a “tourist hot-spot city of leisure, art & pop” will be affected by the UK leaving the European Union. There is an option to use a coach. 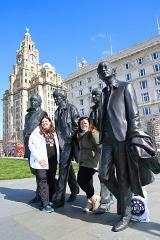 Brilliant Beatles Experience - Total Beatles in Liverpool! 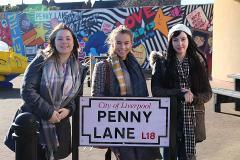 A full “Day in the life” of the Beatles in Liverpool City Region - total Beatlemania with Brilliant Liverpool Tours. This is a group or private tour. 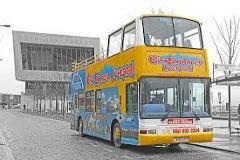 The costs quoted are for if you arrive on your own coach, or you can book our vehicle. 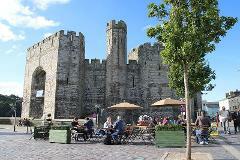 Group tour to North Wales - Three World Heritage Sites! Castles, mountains & breathtaking scenery only 90 minutes from Liverpool. Explore three World Heritage Sites in this one day group or private tour as you journey in to the heart of Snowdonia & North Wales. (Coach hire extra at checkout). Medieval Chester, the beautiful Village of Port Sunlight & Birkenhead Priory. 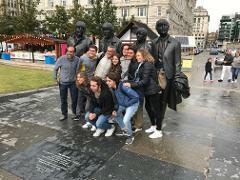 Book a fun Brilliant Liverpool Tour Guide to show your guests around the city by coach, including Waterfront, Pier head, new Beatles Statues, Albert Dock, Cathedrals, Mathew Street and the Cultural Quarter of William Brown Street. 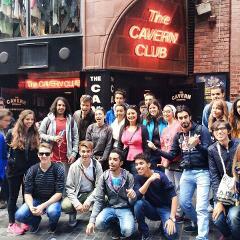 Liverpool Group Tour "One Big Brilliant Day Out!" 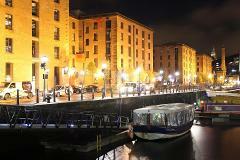 This full day Brilliant Liverpool Tours challenge is the most complete tour of Liverpool & a perfect Cruise Excursion. It includes admissions & lunch. We dare you to do it all! either in your own coach, or we can arrange transport for you. 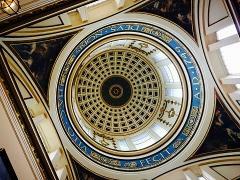 A fun architectural & urban regeneration half walking tour in Liverpool City Centre. This tour is suitable for groups, or as a study day for schools and Universities. Includes refreshments in St Georges Hall. 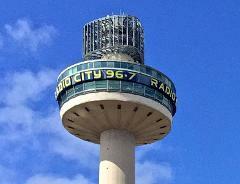 Half day group or private walking tour with a trip up the 138m Radio City Tower. This tour shows how Liverpool has regenerated & emerged as the most vibrant UK city outside of London. Includes a visit to the Worlds 5th largest cathedral. Liverpool Anglican & Metropolitan Cathedrals, Greek Orthodox Church & Princes Road Synagogue, St James in the City (cast iron church) & Scandinavian Seamen’s Church. Perfect as a lighthearted city tour with either walking or coach options. 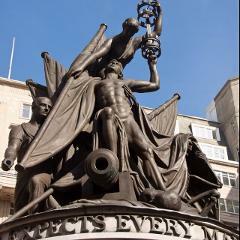 Learn how Liverpool grew to be one of the most important ports in the British Empire with this group or private half day walking tour & dock cruise. The tour takes you underground to see the actual Old Dock wall dating back to 1715. 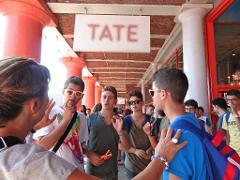 Bring a group on one of our fun 90 minute easy walking tours suitable for everyone. All are on level ground with attractions to visit along the way. The best way to explore this vibrant city & reach places not possible on a motor coach. 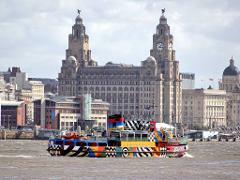 Port Sunlight, Mersey Ferry & Liverpool (Group or Private Tour) - available in six languages. 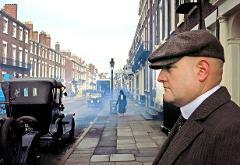 Half Day Private or Group guided tour of the beautiful village of Port Sunlight. Breathtaking views of Liverpool from the famous Mersey Ferry. 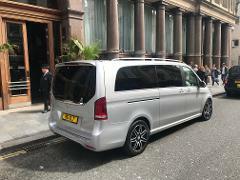 Coach or MPV tour of Liverpool in your coach or book our transport. Available in 6 languages. 2 hour, Half day or Full Day Tour Guiding Services within North Wales. We will tailor your itinerary & we can arrange suitable transport for your visit. Liverpool Three Peaks & Cavern Challenge - ideal VIP Corporate tour or Hen Party! VIP - Three peaks & a Cavern! 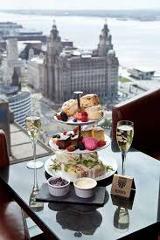 This is the most fun VIP three tower tour finishing with a luxury afternoon tea in the Panoramic 34 restaurant. Enjoy the magic of Liverpool World Heritage Site in your luxury vehicle with a local Tour Guide., Waterfront, Docks, Sport, Culture, Film locations, World's 5th largest cathedral, Penny Lane, Strawberry Field, Cavern Club & shopping! Voyage scolaire de 5 jours Liverpool, Manchester, Chester, Nord du Pays de Galles et parc à thèmes Alton Towers. 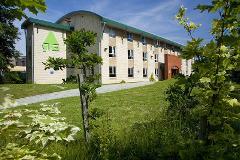 C’est un séjour scolairen résidence à l'auberge de jeunesse qui combine réflexion et activités dans une ville moderne avec une journée au nord du Pays de Galles. Le dernier jour de ce voyage est une visite au parc à thèmes Alton Towers. 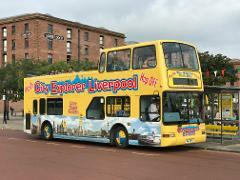 Liverpool 4-hour Guided Shore Excursion in an executive vehicle, History, Art, Music, Film Locations, Beatles & much more. Explore Liverpool in this guided shore excursion aboard your executive vehicle. Your local Tour Guide will show you the World Heritage Site, Museums, Galleries, Cathedrals, Parks, Penny Lane, John Lennon's house, LFC stadium & much more! Book a Liverpool Tour Guide for 2 hours. 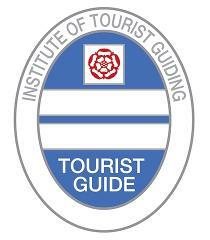 2-hours Tour Guiding Services. Liverpool is a compact city & walking tours work extremely well even from the cruise terminal. We will tailor your itinerary & we can arrange suitable transport for your visit. Full Day Private Tour Guiding Services. 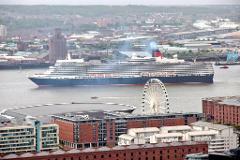 Liverpool is a compact city & walking tours work extremely well even from the cruise terminal. We will tailor your itinerary & we can arrange suitable transport for your visit. Half day Private Tour Guiding Services. Liverpool is a compact city & walking tours work extremely well even from the cruise terminal. We will tailor your itinerary & we can arrange suitable transport for your visit. Shore2Shore Excursions Liverpool Shore Excursion - 49 Pax (plus Guide) air con coach in Spanish. 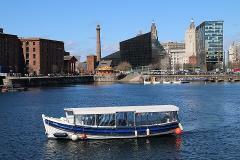 Full day Liverpool guided Shore Excursion in Spanish in 49 seater air conditioned coach. Meet & greet at Cruise Terminal, Beatles sites, World Heritage Site, Cathedrals and lots of stops and opportunities to take photographs. 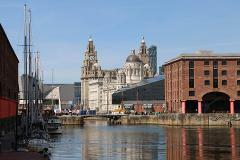 City Tour of Liverpool, including two cathedrals, Albert Dock, Pier Head and William Brown Street. 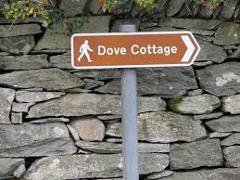 Fully guided private Day out in luxury air conditioned vehicle Lake District (Dove cottage & Lake Windermere) - Scenic Drive to Lakes, Visit Grasmere, Gingerbread, Dove Cottage & Windermere Cruise.- good idea for shore excursion. 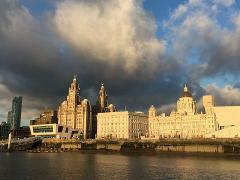 Full day Liverpool Tour Guiding Services for up to 15 people. Liverpool is a compact city & walking tours work extremely well even from the cruise terminal. We will tailor your itinerary & we can arrange suitable transport for your visit. Private Guided Shore Excursion from Liverpool Cruise Terminal - Liverpool, Chester, Mersey ferry Cruise with a local tour guide. 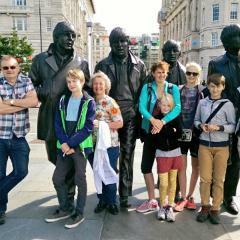 6-hour private guided Beatles themed Liverpool Shore Excursion. 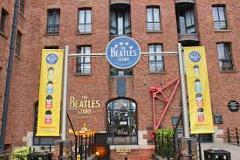 Visit the Cavern Club where the Beatles played 292 times in the 1960's & a guided tour of the Casbah coffee club which is the most authentic Beatles attraction in Liverpool. Private fully guided day out in V-class to Medieval City of Chester with a walk along the walls & visit the Cathedral. Visit the beautiful English village of Port Sunlight which was built for the "Sunlight" soap workers in 1900. Private guided Liverpool Tour. 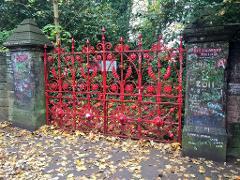 3-hours in a chauffeur driven car; Cavern Club, Penny Lane, Strawberry fields & outside John Lennon & Paul McCartney's houses, then 3-hour guided walk in heart of City Centre. 138m Tower Tour & Mersey Ferry. 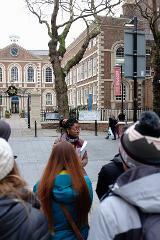 Join this thought-provoking 2-hour walk in the city centre & learn about the legacy of slavery in Liverpool. Find out how the maritime mercantile development led to the dark wealth of the most powerful provincial port in the British Empire. This 2-3 hour tour completely misses out anything to do with The Beatles and focuses in a lighthearted way how & why Liverpool has changed. It explores the World Heritage Site. We can guide in your vehicle or you can book transport from us. 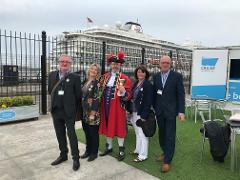 Relax at the end of your conference and let us show your delegates around Liverpool City in a very lighthearted, informative & fun walking tour. 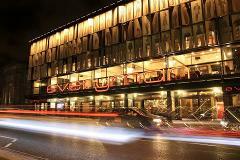 We can start and finish the tour at a Liverpool Hotel, the conference centre or a restaurant. 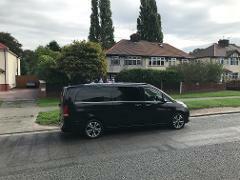 Private guided tour of Liverpool, sightseeing and Beatles for up to six guests travelling from Manchester - Luxury fully guided tour in chauffeur driven Luxury V-class or S-class Mercedes with a qualified and insured tourist guide. Castles, mountains & breathtaking scenery only 90 minutes from Liverpool. Explore three World Heritage Sites in this one day group or private tour as you journey in to the heart of Snowdonia & North Wales.